We are really excited that you are thinking of sharing your special day in the stunning setting of Gibraltar or Spain. Whatever your reasons are for wanting to get married abroad we want you to fall in love with this gorgeous place and all it has to offer. Here at Mediterranean Weddings we hold your hand and walk you through the journey, everything from what legalities you need to ensure you cover to the décor on the day to the photography to the entertainment to the accommodation for your guests. You need to know that you are in safe, experienced hands, that can be there when you have a question, that can jump on Skype and talk through the wedding styling with your very own dedicated wedding stylist, or talk “face to face” with your dedicated photographer Giles, or talk through the planning with your dedicated wedding planner, Jeanette. This is what we are all about at Mediterranean Weddings, helping you to enjoy your wedding planning journey. We understand how overwhelming it is planning a wedding, add to that travelling to a different country bringing along friends and family and pondering whether to buy an extra seat on the plane for “the dress” and it is easy to see why you may wander off in a bubble of overwhelm. But, when you have an experience wedding planning team who know how to plan, run and deliver the luxurious wedding you are dreaming of, in a setting that cannot be rivalled, then you can go back to doing the fun parts of the wedding planning. We can help you with all areas of your wedding, everything from the small details to the legal requirements. 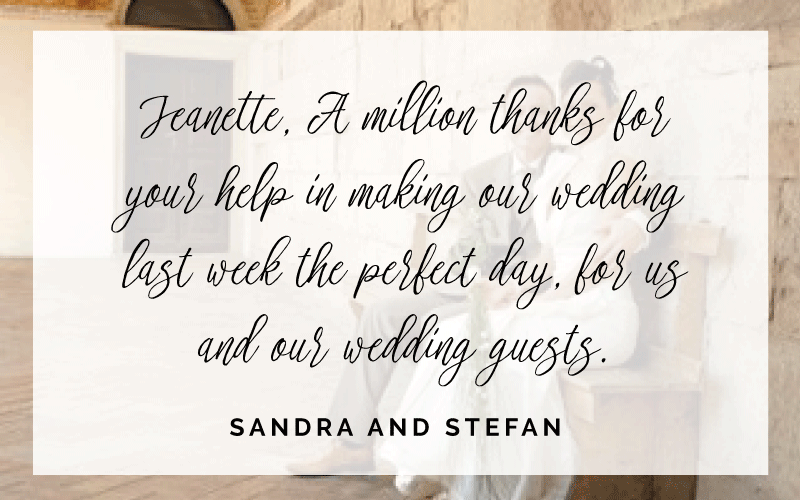 You are in safe hands with Jeanette, your dedicated wedding planner, and her exclusive team. Get in touch to see how we can help you. Medweddings and Events is is listed among the World's Top 50 Best Weddings Planners" by Destination Weddings & Honeymoons Abroad, UK. Thanks DWHA magazine for the opportunity to promote Gibraltar as a wedding destination!